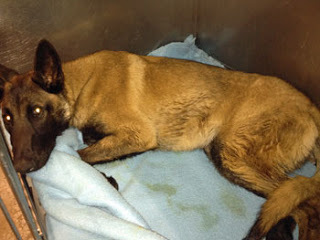 Andy is the Malinois we just had to save! We took him directly from the shelter to an ER vet. What they found when they operated on Andy surprised everyone. An entire corn cob was lodged in his intestine and was already eroding into the tissue wall causing infection. The operation required that a significant part of Andy's colon be resected (cut out) and the two remaining ends had to be reattached. As of tonight, Andy is resting in the ER, but he isn't eating on his own. Who could blame him? He is relying on IV fluids and antibiotics right now, and we are doing everything possible to make him comfortable. He will remain at the ER for at least a few more days–until he is eating and standing up on his own–and then he will move to a more affordable vet to continue his treatment. Andy's first night and day at the ER cost $1800.